The evo-psycho bros dismiss slavery and its after-effects in their certainty that the only possible explanation for continued black poverty, lower test scores etc, is genetics, as Bo and Ben Winegard state in their article for Quillette entitled A Tale of Two Bell Curves. Of course, there are other possible explanations of the Black-White gap, such as parenting styles, stereotype threat, and a legacy of slavery/discrimination among others. However, to date, none of these putative causal variables has been shown to have a significant effect on the IQ gap, and no researcher has yet made a compelling case that environmental variables can explain the gap. 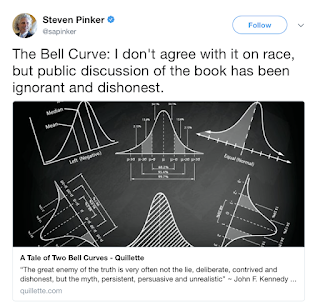 On Twitter Steven Pinker provided a link to the article but made sure to say he didn't agree with the Bell Curve on race, something he also says in his own Blank Slate. Curiously I have yet to find Pinker explaining why, although he appears to agree with every other claim in The Bell Curve, he does not agree with that particular one. Mostly he just whines about how the Bell Curve was misrepresented by the usual suspects. But the mention of slavery/discrimination indicates that when evo-psychos talk about black/white differences they are talking about North America since the beginning of the slave trade. As I pointed out earlier in this series, evo-psycho bros are actually not too interested in determining the genetic ancestry of people who self-identify as "black" and "white" in the Americas and ignore the fact that the average black person has one-quarter ancestry that is not African. The researchers, who included university and government population scientists, analyzed census forms for 168 million Americans, and found that more than 10 million of them checked different race or Hispanic-origin boxes in the 2010 census than they had in the 2000 count. Smaller-scale studies have shown that people sometimes change the way they describe their race or Hispanic identity, but the new research is the first to use data from the census of all Americans to look at how these selections may vary on a wide scale. Notice the reference to J. Phillipe Rushton, president for ten years of the white supremacist Pioneer Fund. INTERPOL's International Crime Statistics are no longer being collected from member countries and previous statistics are no longer published. The decision to remove the statistics was taken as some users and some members of the media were making comparisons between countries based on these statistics, when different collection methods make such comparisons problematic. They don't say when they stopped publishing crime statistics. The Biosocial Criminology first edition was published in 2009. 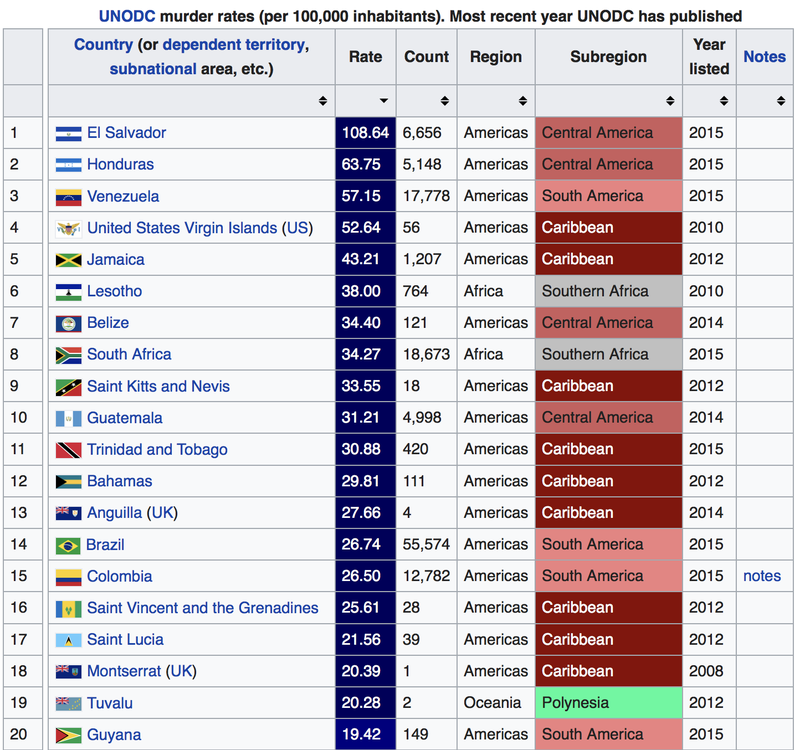 I was able to look up the United Nations Office on Drugs and Crime (UNODOC) and their table displays only two African nations in the top 20 murder rate countries. 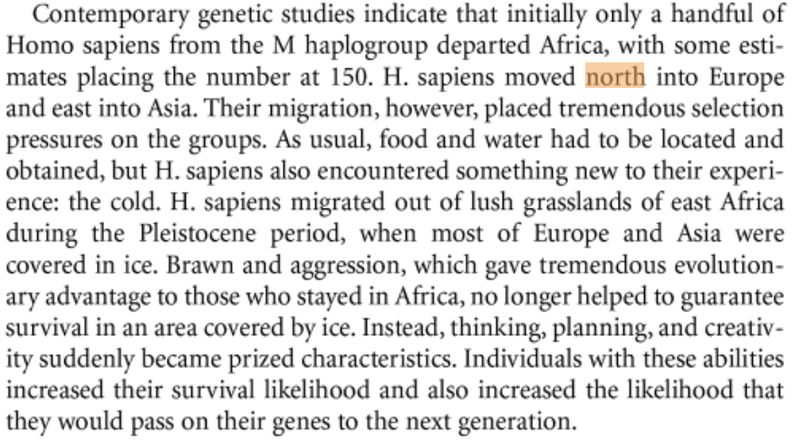 We don't know exactly where Wright got his INTERPOL data but we do know where he got his theory about Africans. His theory is what I like to call the "Northern Superiority Hypothesis" - looks like I have to be the one to name it because even though this seems to be the basis of all evo-psycho bro thought on the inferiority of black people they haven't yet named it. 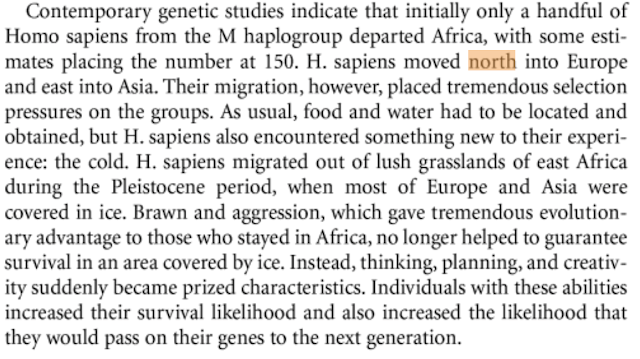 As far as I have been able to tell, the Northern Superiority Hypothesis was invented by Richard Lynn. We'll talk about him next.